← Don’t Forget This Critical Nutrient.. Try this little test. Put out some fruit or vegetables on the table with a bowl of chips for family and friends to grab and munch on. See for yourself which one disappears faster. You might find that the surprising answer is the grapes. So what’s all this talk of a junk food nation? But be careful. Leaving a fruit bowl out with bananas, apples and pears, etc., may backfire because people may not feel particularly hungry enough to tackle all that, they’re just grabbing munchies from habit. You want to guide that hairy monster of habit, not try to slay him. I got this idea from a friend; she used green beans vs chips, and says her kids grab handfuls! So why not try it? Heres more on snacking from an earlier post. 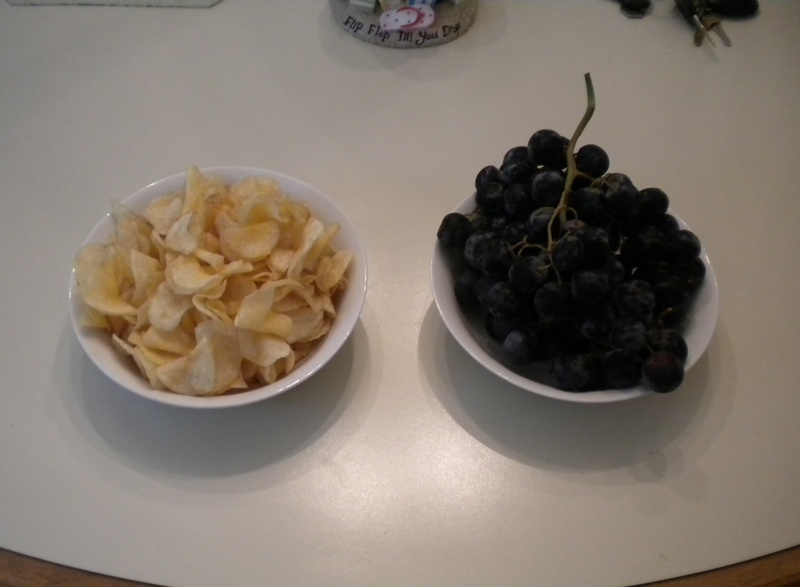 This entry was posted in Diet, habits and tagged diet, dieting, eating, food, grapes, Habits, health, snacks, weight loss. Bookmark the permalink.